Just recently I was visiting in Holland. Holland is a country which was formed out of the protestant reformation. 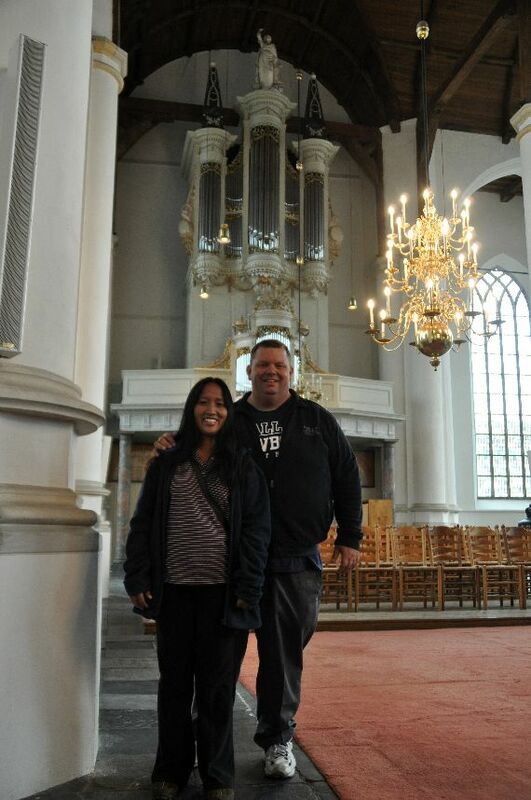 While I was visiting in Holland I really wanted to visit an authentic “Protest” church! (Protestants are so named because of their “Protest” of the Catholic Church. It was not only name calling, but a violent takeover of Catholic churches and resulted in wars some of which lasted nearly a century.) While I was in Holland I got to visit a “Protest” church. You could see where they had destroyed images of saints, and they even had some of the destroyed headless images on display, the gothic style churches were amazing. The stained glass windows were destroyed and replaced with clear glass, name and images on tomb stones of catholic sympathizers were chiseled out of the marble markers. Apart from the signs of the past violent protests I really enjoyed the worship. We sang protest hymns of the Dutch and others translated from famous protestant leaders. Now, I think everyone knows that in the New Testament there were no denominations. The only reference to a “denomination” was the “sect” of the Pharisees and the Sadducees. Jesus prayed that HIS Church would be one. For the most part, the church remained an organic and dynamic entity until the reign of Constantine when in 325 A.D. he declared the Roman empire to be “Christian”. That set in motion a legal and permanent hierarchical structure in which the church no longer existed as an organic and dynamic entity. In the 16th century Martin Luther challenged the church on one specific doctrinal point. Salvation had come to be understood in terms of membership and obedience to the Roman Church. Salvation was issued through the Roman Church. Famously, Martin Luther challenged this doctrine and pointed to the Bible in saying all believers were saved by faith in Jesus Christ alone. This was in stark contrast to the teaching of the Roman Church. For his position and the position of his followers they were excommunicated from the church and they became known as “Protestants” (or protesters). It seems the last 400 years the characteristic of protestant churches has been continually protesting over nearly every issue which can be imagined. Because of this, all non-Roman Catholic churches are considered to be “Protestants” (or protesters). There has never been a single governing body or organization which had the name “Protestants” or a denomination of “Protestants”. It is simply a term which is used to describe all believers outside of the Roman Catholic Church. They are “protestors”. What has developed after these nearly 500 years is untold thousands of different church groups. Some are called denominations, some associations, some fellowships, some councils, some alliances, some networks, some movements, or many churches simply stand-alone and many formed their own neo-denominations which were completely new groupings of churches. The division of churches which started in Europe nearly 500 years ago was most promoted in America during their last 200 years of experimentation with modern democracy. Democracy means “people rule” and one clear characteristic of the nation of America in general is that people have the right to make all decisions for themselves. Americans in general are very individualistic. Because of the economic wealth of America which includes mostly “Protestant” Christians as the majority religion denominations have continued to multiply at exponential rates around the world. The World Christian Database, a project of Gordon-Conwell Theological Seminary tracks over nine-thousand protestant denominations globally.1 In less than 500 years more than nine-thousand groups have been split off; mostly in “protest” of someone else. Around the world the protesting continues. Sometimes it involves a chisel and hammer removing the name of a group, but mostly it is just being more right than everyone else. This “protesting” has greatly affected the unity of the Cambodian church in only a few short years. I remember in early 1994 nearly every church leader and missionary came together under one roof to form a unified Cambodian church. At one time, it represented more than 80% of the Christians in Cambodia. Now it seems 80% of the Cambodians dis-unified and each has their own “denomination” (or whatever fancy new word they call them now). On this October 31, 2011 I think we need to end the protestant reformation. We need to refuse to join in doctrinal wars which have been ongoing for hundreds of years. Did you know John Calvin and Jacobus Arminius died over 400 years ago? Why are we still fighting in their name? I am just one voice, I know, but I hope that many more will join me in ending the protest. Let’s end the protest of other Christians; the protest of belief; the protest of anyone who thinks differently than me! Let’s end the protest of fellow believers in Christ. I believe we need a new reformation, a reformation of love. Let’s not debate doctrine for another 400 years, lets demonstrate love from here on out. Let love be our measure, let love be our guide. Wouldn’t it be so much better to be known as a people of love, rather than a people of protest? I am sure the effects of love will be far much greater than the last nearly 500 years of protesting. 1 “World Christian Database, 2011”. Gordon-Conwell Theological Seminary, 2011. Accessed online at http://www.worldchristiandatabase.org/wcd/about/denominations.asp on August 28, 2011.